NASA’s Office of the Chief Human Capital Officer (OCHCO) has undertaken research to understand the disruptors driving the future of work and implications for NASA so that it can evolve talent strategies aligned with the new work, workforce and workplace of tomorrow. The result is the Future of Work – a report and framework, which reveals eight major themes that highlight insights, challenges and tangible opportunities for NASA. The Future of Work acts as a foundational compass as NASA embarks on a new journey toward a future that enables its workforce to be adaptable, resilient, productive and bold. For organizations to thrive in today’s world, it is imperative to move faster, adapt quickly, facilitate rapid learning, and embrace the dynamic needs of an increasingly diverse workforce. Work today requires fluid talent to meet ever increasingly complex work, requiring multidisciplinary skills, delivered by teams of people, networked together that have overarching goals tied to organizational performance and productivity. To attract top human talent, organizations must embrace the new dynamic human talent pool that enters the organization through all manner of new work arrangements, (e.g., traditional employment contracts to citizen scientists); and at the same time strategic workforce planning, acquisition and management practices must enable a workforce that is resilient to shifting mission priorities. Redefined talent runs along a continuum ranging from the traditional full-time employee to part time workers and supplemented by machine talent (e.g., artificial intelligence and robotics). Rising life expectancies and an aging global workforce present organizations with unprecedented challenges and untapped opportunities. Organizations with a science and technology forward mission must highly value and provide learning and development for its workforce to ensure continued relevance and competitiveness. Success depends on providing employees with experiences that inspire and challenge them throughout their career. Organizations need well trained, experienced leaders and professionals that can be matched with mission needs through the use of temporary assignments, internal rotations, reassignments and reinstatements, details in place and external engagement. Work can now be conducted anywhere and anytime through making information, data and tools available to an increasingly mobile workforce. Workplaces must also adapt as the work and workforce evolves. Modern workspaces are being redesigned for flexibility, autonomy and collaboration and to enable an increasingly remote, agile workforce. The ability of organizations to leverage data to drive insights to action is critical. Yet data access is often prohibited due to the underlying tension between sharing and security. An enterprise data management strategy and modern, common data architecture is critical to securely share information and data. Digital transformation that leads to more informed decisions and operational efficiencies is occurring in every industry and remains an ongoing process across the federal government. Advances in technology will allow organizations to better organize and distribute work tasks to qualified individuals, replacing or outsourcing others and generally augmenting the existing workforce. As machines start to think and act humanly, organizations will be able to more efficiently assess real-time data, assign responses, allocate tasks based on assessment, streamline knowledge driven processes, and enable more objective decision-making. Each theme includes insights gleaned from the research and analysis, and highlights corresponding challenges and opportunities based on NASA’s position today. Upcoming blog posts will focus on the eight themes in more detail. Nick Skytland | Nick has pioneered new ways of doing business in both government and industry for nearly two decades. He leads the Future of Work initiative at NASA and is the Agency Talent and Technology Strategist in the Talent Strategy and Engagement Division within the Office of the Chief Human Capital Officer (OCHCO). For the last 60 years, NASA has successfully attracted innately curious, relentless adventurers who explore the unknown for the benefit of humanity. As NASA prepares for the next 60 years, we are exploring what the Future of Work means for our workforce and our work. Follow along as we uncover the disruptors driving the changes to our world and unlock new insights and opportunities for building the workforce of tomorrow. 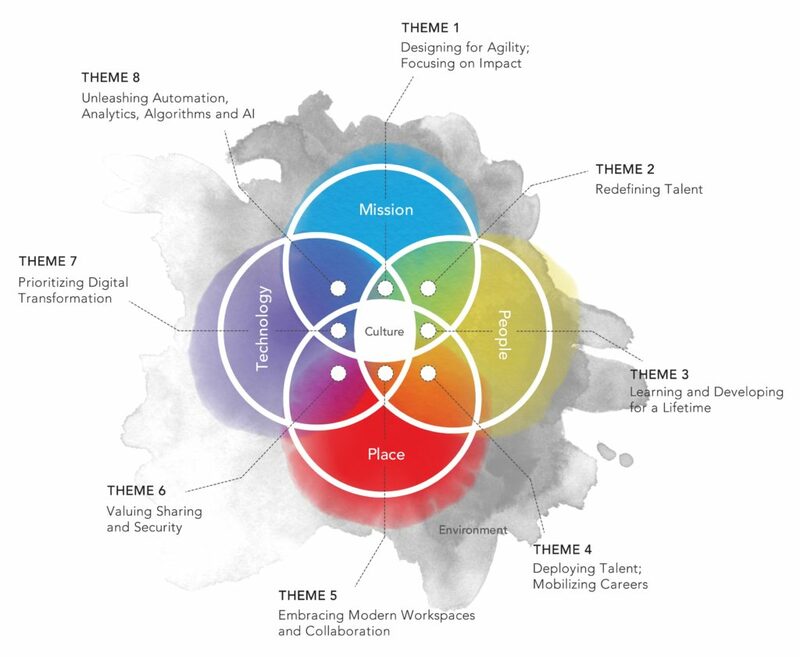 The NASA Future of Work framework is a useful tool for any organization that is interested in organizing, recruiting, developing, and engaging 21st century talent. Why I Gave NASA A Second Chance?